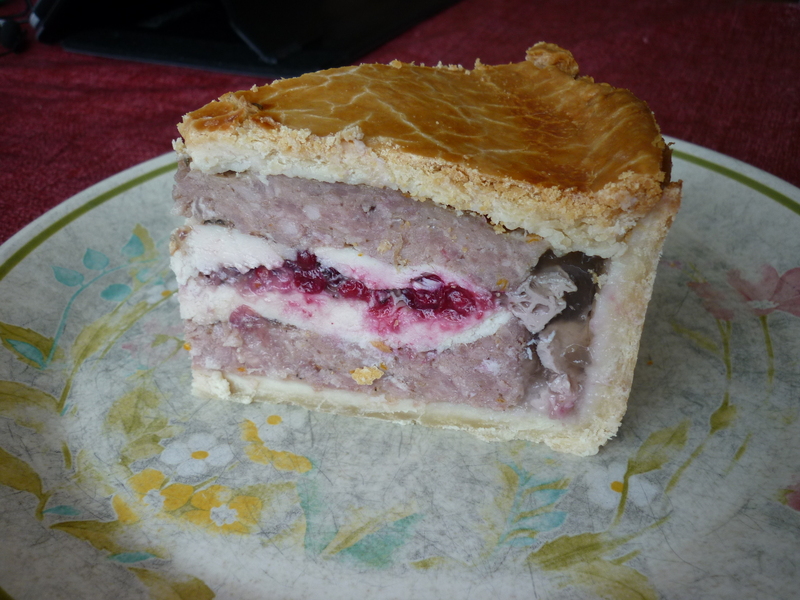 I am exceedingly proud of this dish. 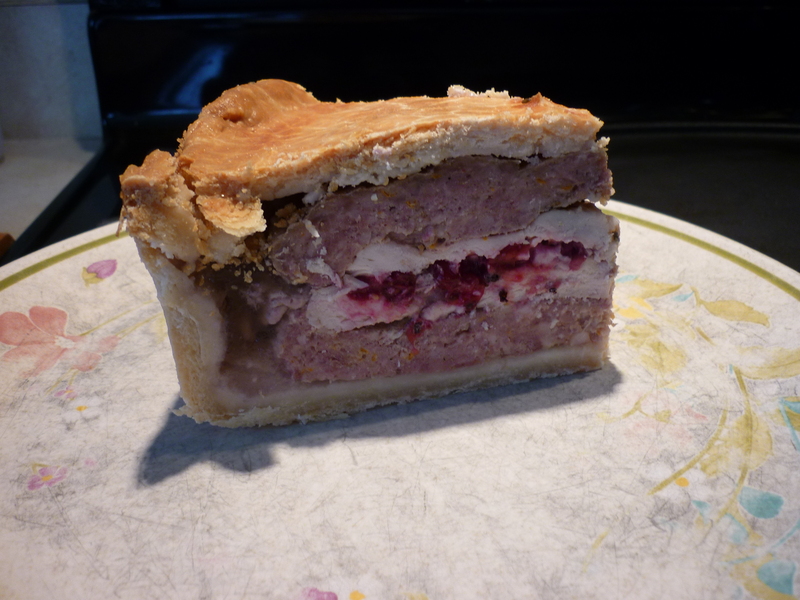 The recipe is here: http://www.melangery.com/2012/05/chicken-and-red-currant-pie.html. 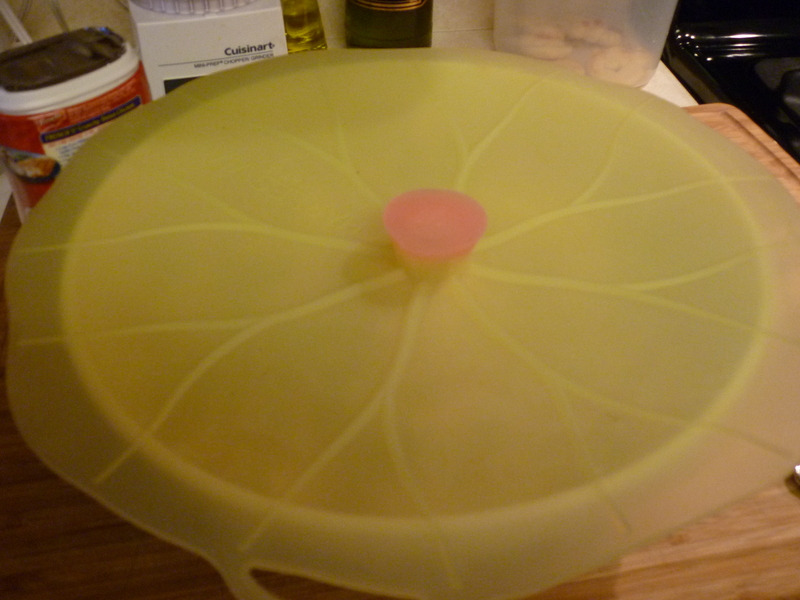 I made my own “aspic jelly” by rendering chicken bones. 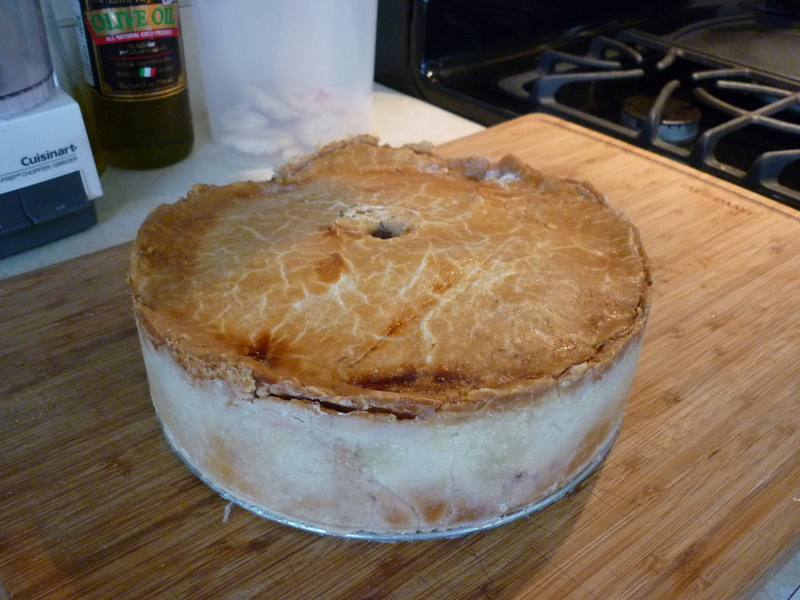 I made my own pie crust from scratch! I used ground turkey instead of ground chicken, although ground chicken would have been better. It came out so beautiful! I just can’t believe it. 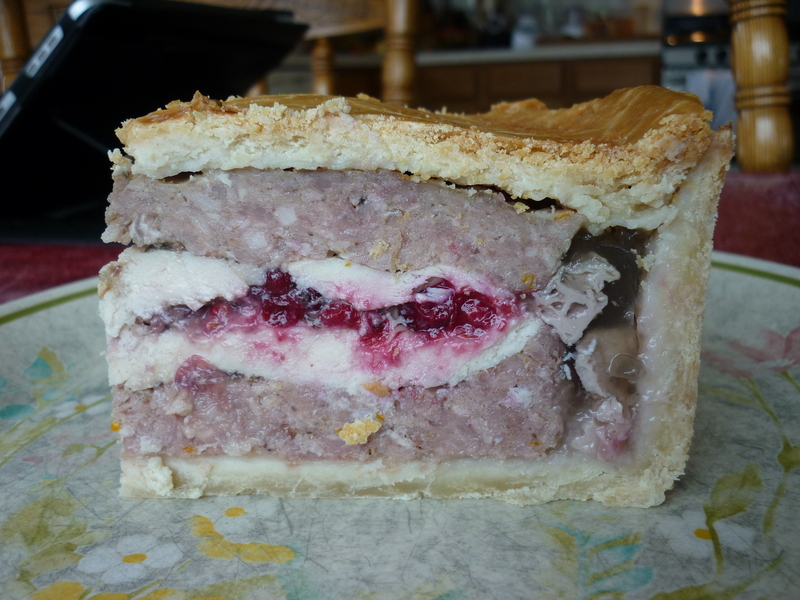 I used a lean breakfast sausage (think Jimmy Dean) for the ground sausage or veal component. The overall flavor was a bit bland and Italian sausage would have been great, or maybe even sage sausage. 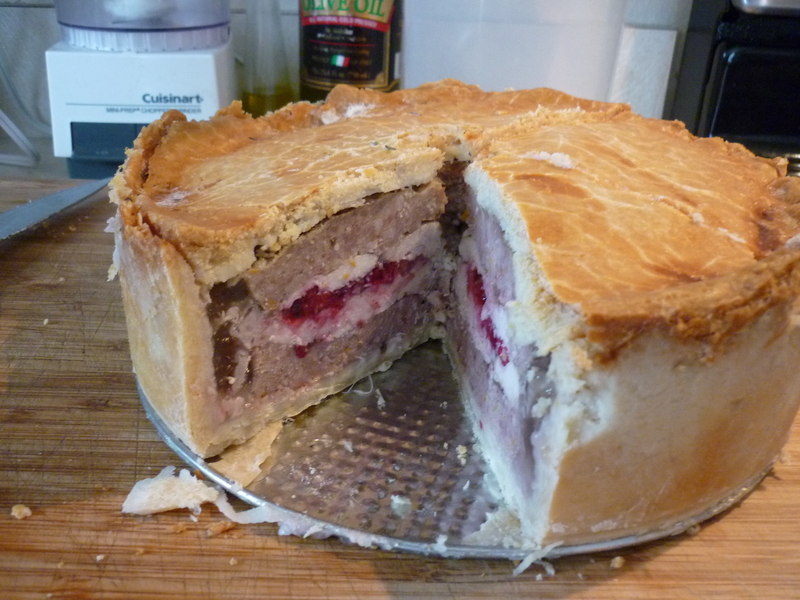 High praise for this recipe. 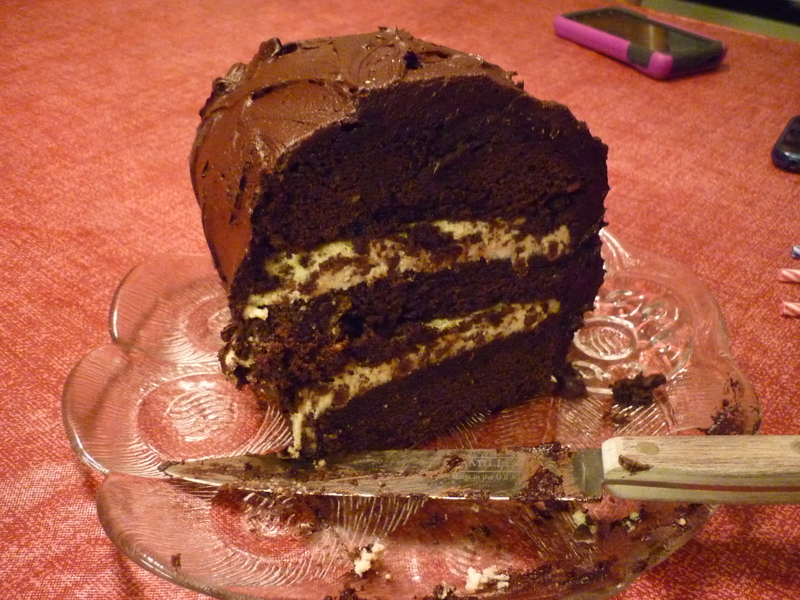 Pictured here is half a slice. Here it is finished. 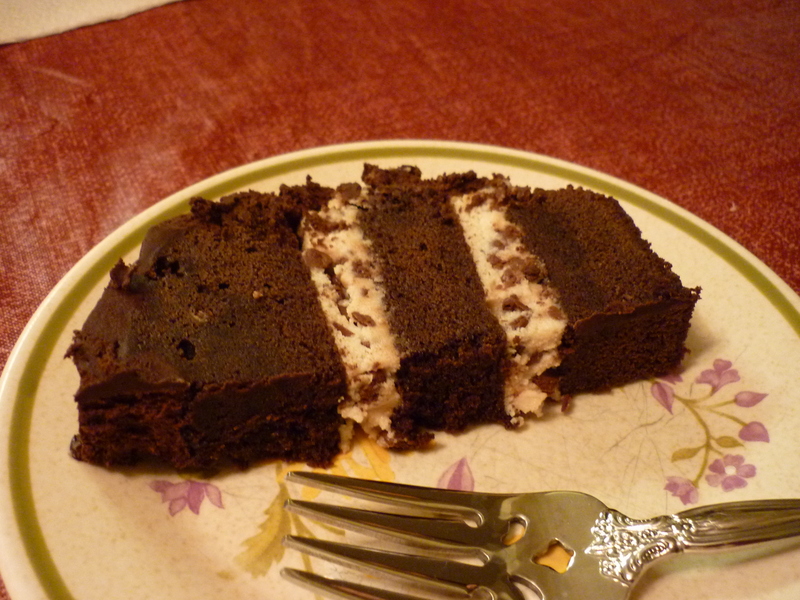 The rich, rich chocolate flavor is decadent. 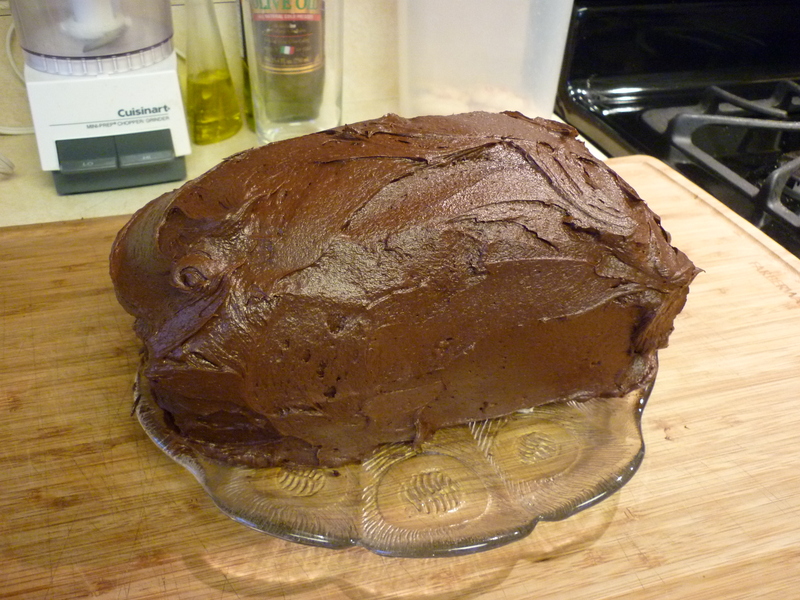 My favorite part was the icing. The only comment I can make about the recipe is that it took about 80 minutes to bake instead of the 70 listed in the recipe. 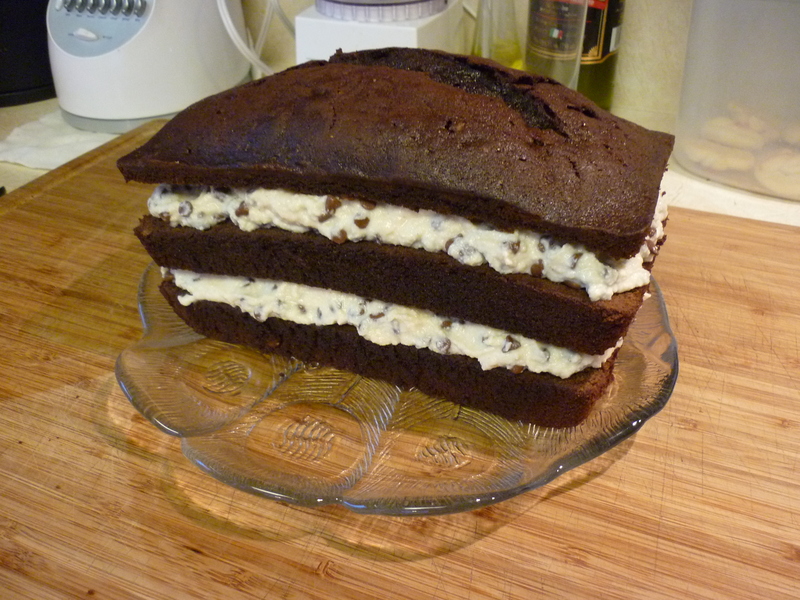 Yes, another recipe with processed food ingredients. My bad. Sorry. There is no doubt that you could substitute any number of things for the processed foods. This originally came from my friend Miriam and I have tweaked it through the years. There are no specific quantities, just eyeball it. 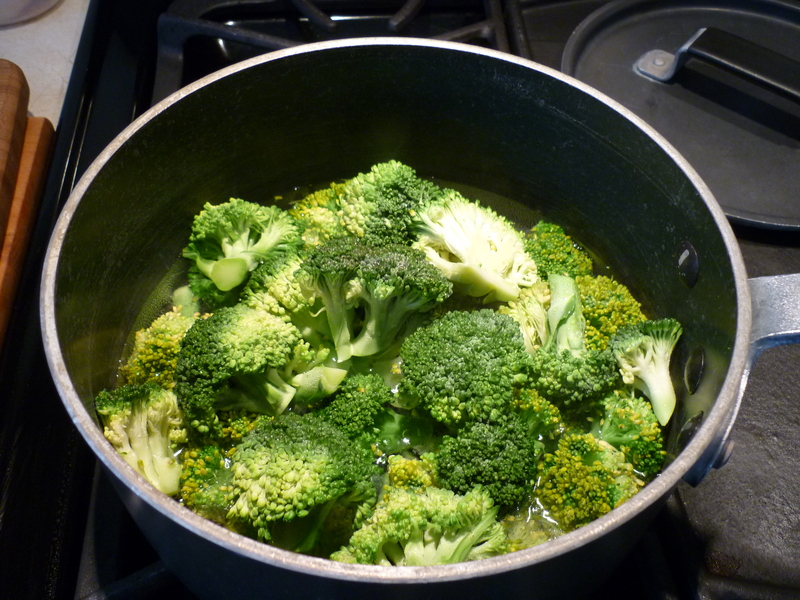 For the vegetable component, I like to use cooked broccoli. 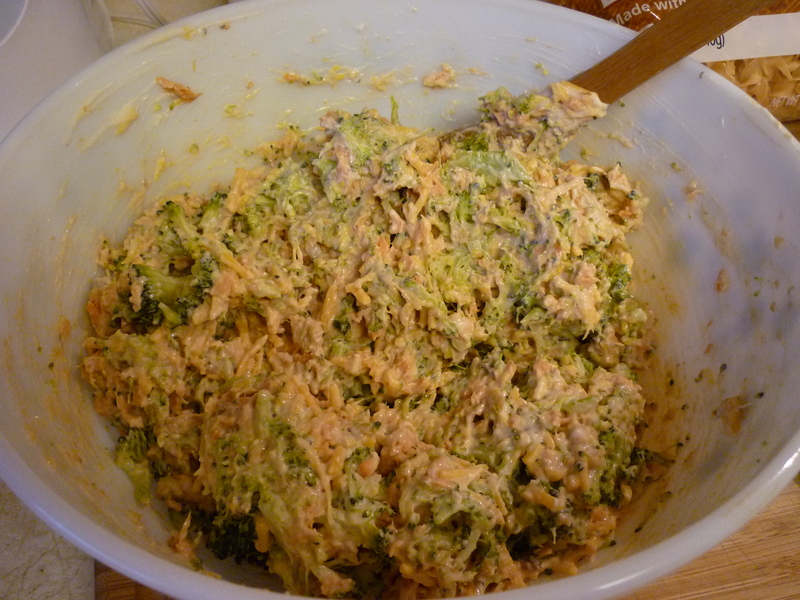 If you do not like broccoli or do not have it, a can of Veg All will be fine. I also use home-canned salmon, a pint. I like to can salmon with a whole jalapeño pepper in it and then use one of those pints in this recipe. 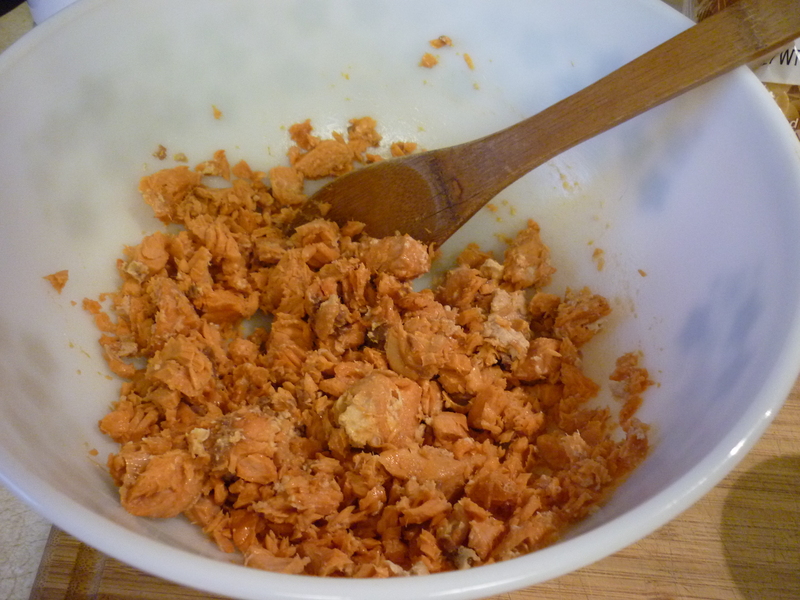 I’m nearly out of the jalapeño salmon so I used regular canned salmon here. My son added Tabasco sauce quite liberally to his plate to compensate. Good idea. 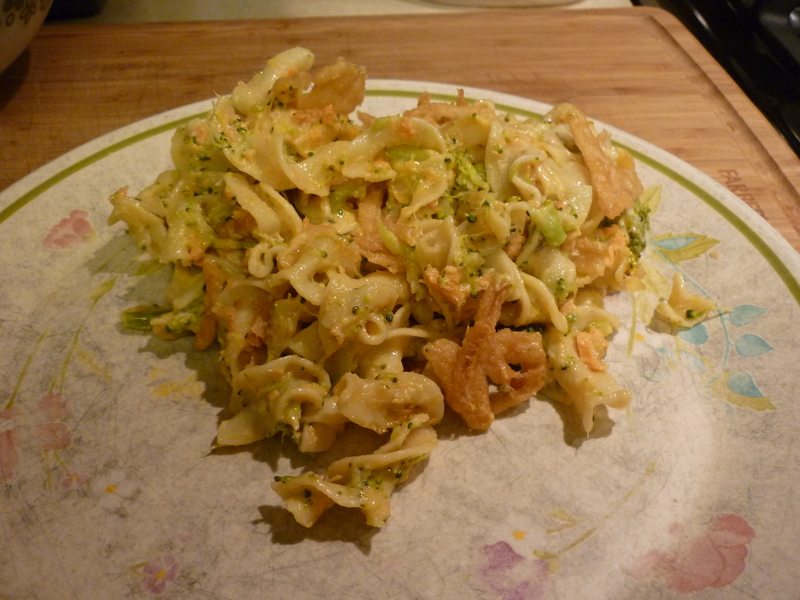 Start by cooking a couple heads of broccoli florets. 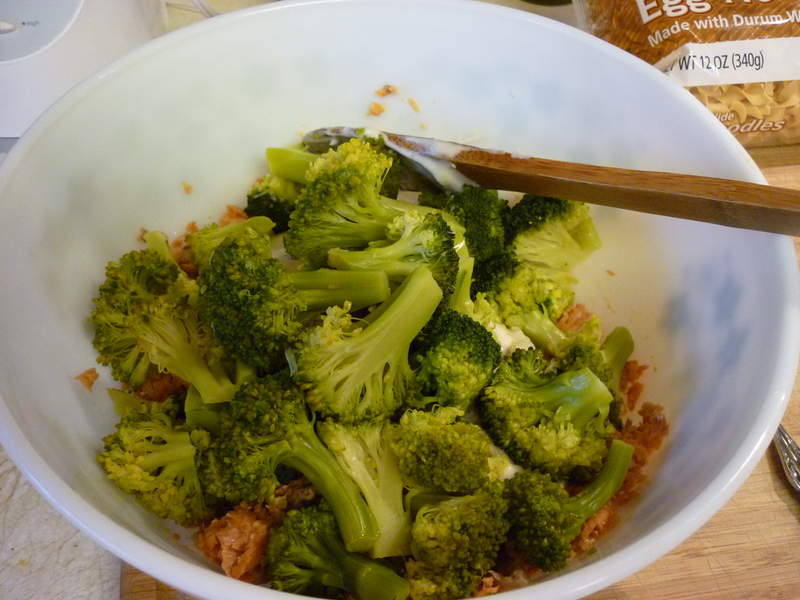 In addition to broccoli (or Veg All) here are the other ingredients. 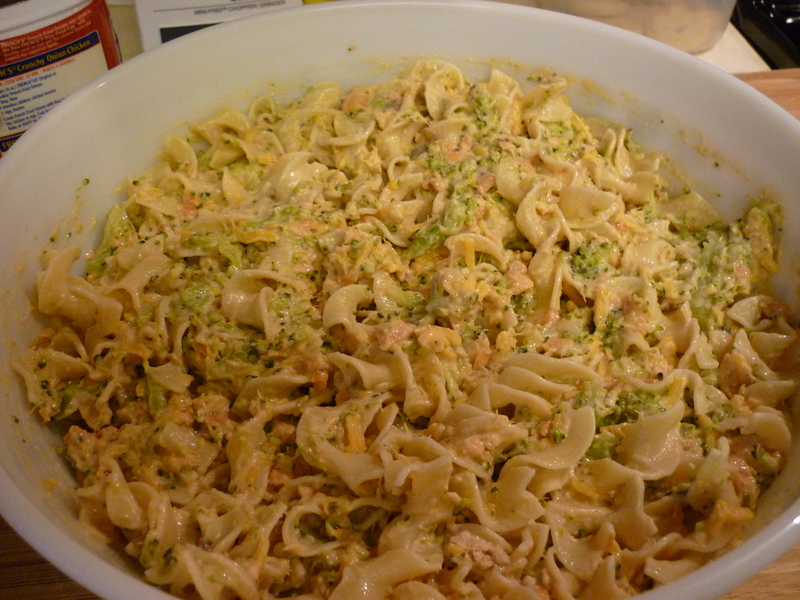 Drain a pint of canned salmon and crumble into a large baking dish. I always grease my dish first, is that wrong? Whatever. It works. 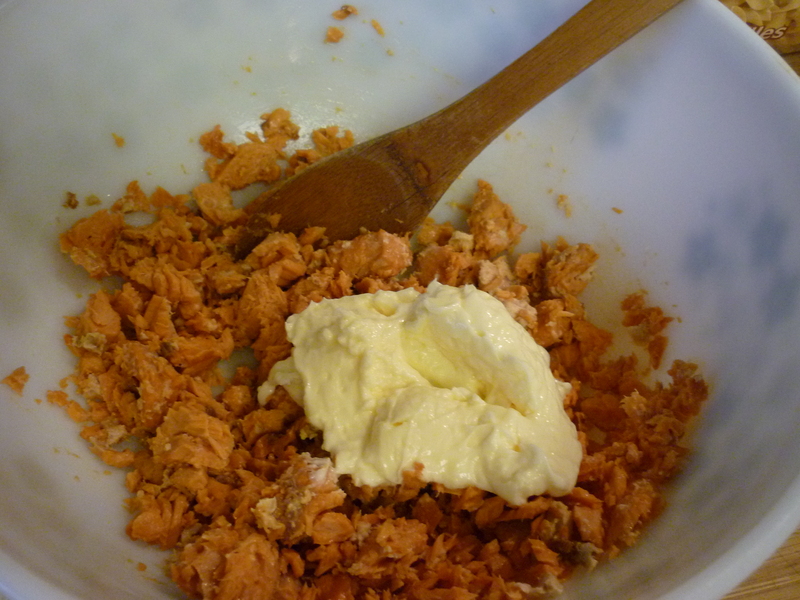 Add a large spoonful (1/3-1/2 cup) of mayonnaise to the crumbled salmon. 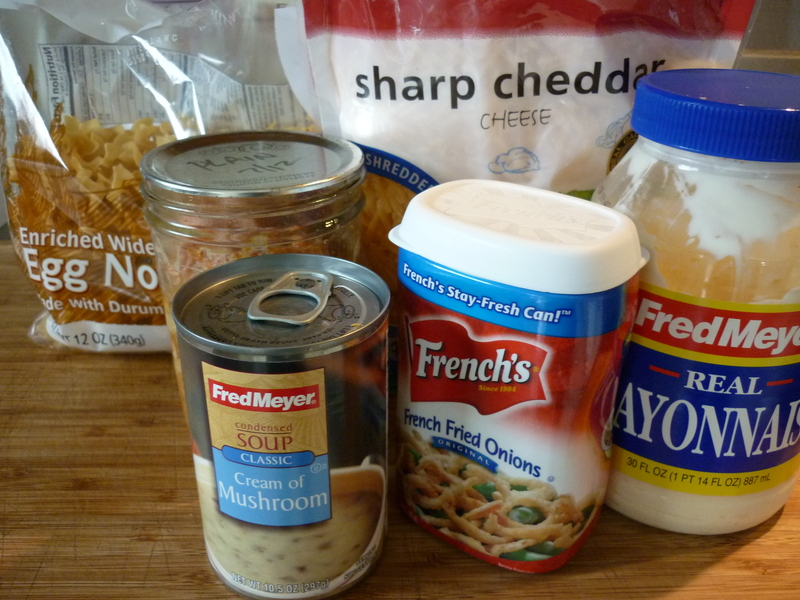 Add a 10.5 oz can of cream of mushroom soup. 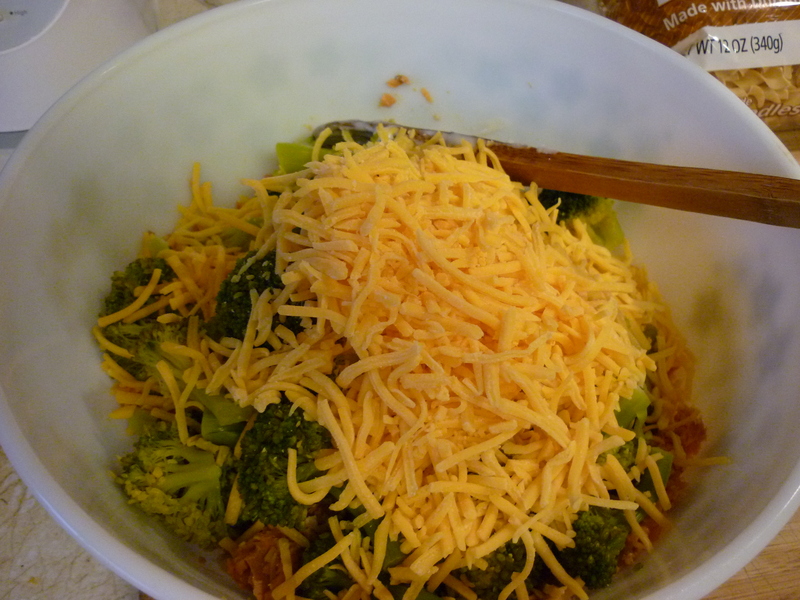 Add a couple cups of grated sharp cheddar cheese. Stir the ingredients in the bowl together. Cook 12 oz. 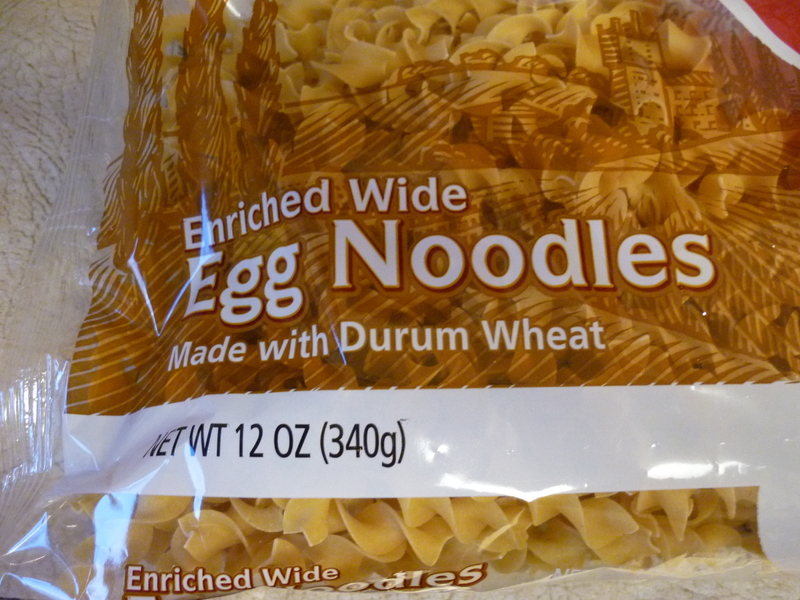 of egg noodles as the package directs to al dente. Stir cooked noodles into the dish. 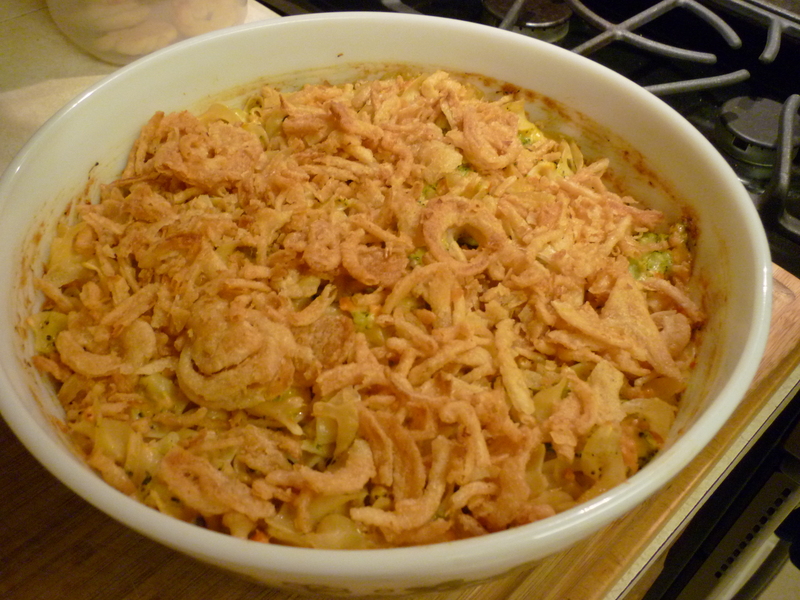 Remove the cover and sprinkle french-fried onion pieces across the top. Bake an additional 5 minutes. 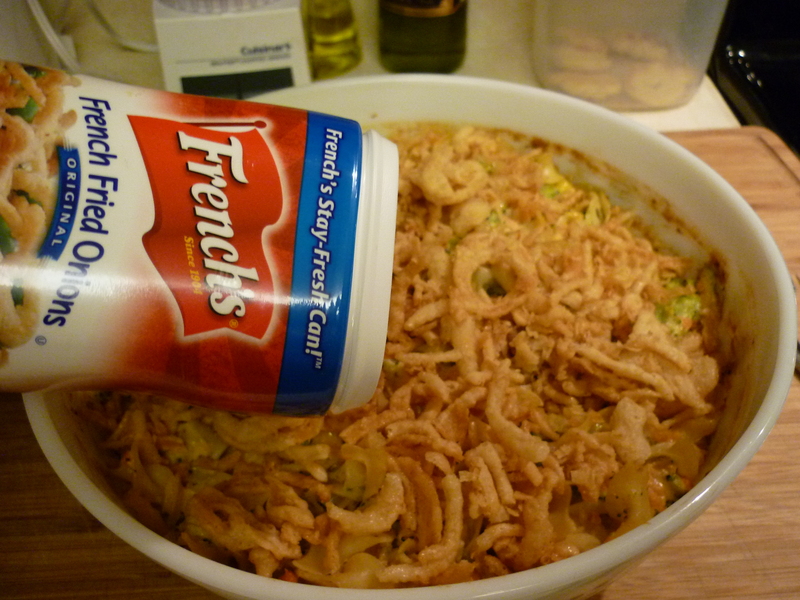 Do not over-bake because the french-fried onions brown very quickly. Remove from the oven and serve while warm. This will feed about four to five hungry people. 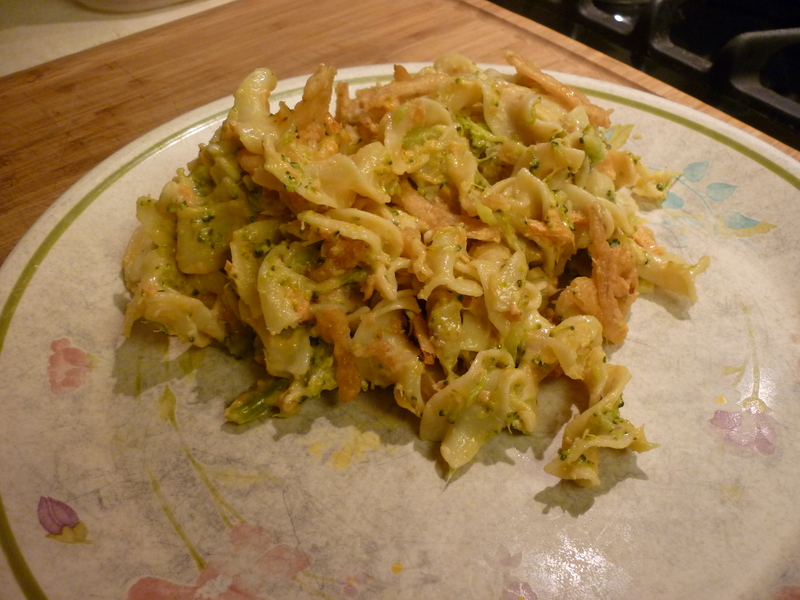 This dish was my son’s favorite when he was a little boy. Based upon his reaction last night while eating our leftovers, it may still be his favorite. Start with a one-cup measure, or other small mixing bowl. 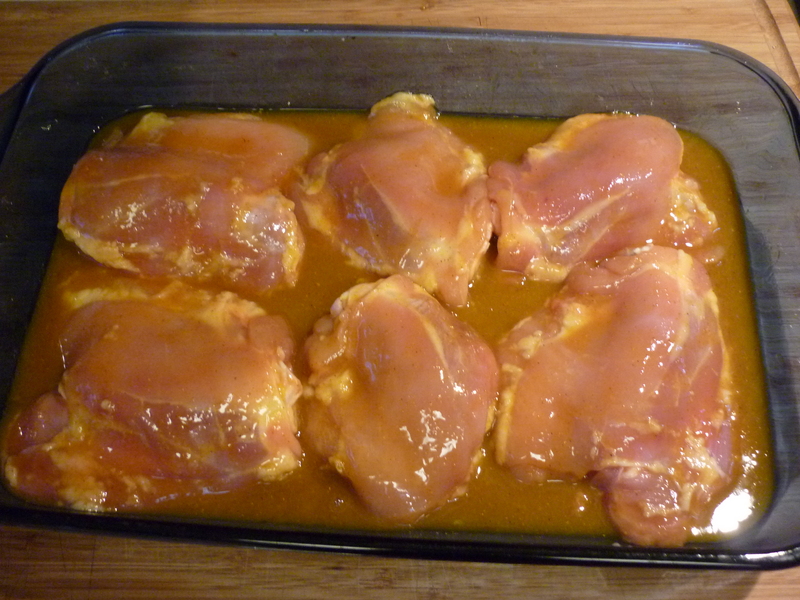 In it, mix 1/2 cup honey, 1/4 cup prepared mustard (I use yellow, but I suppose Dijon or brown would be good), and 1 tsp. curry powder. Pour into a greased 9×13″ pan. 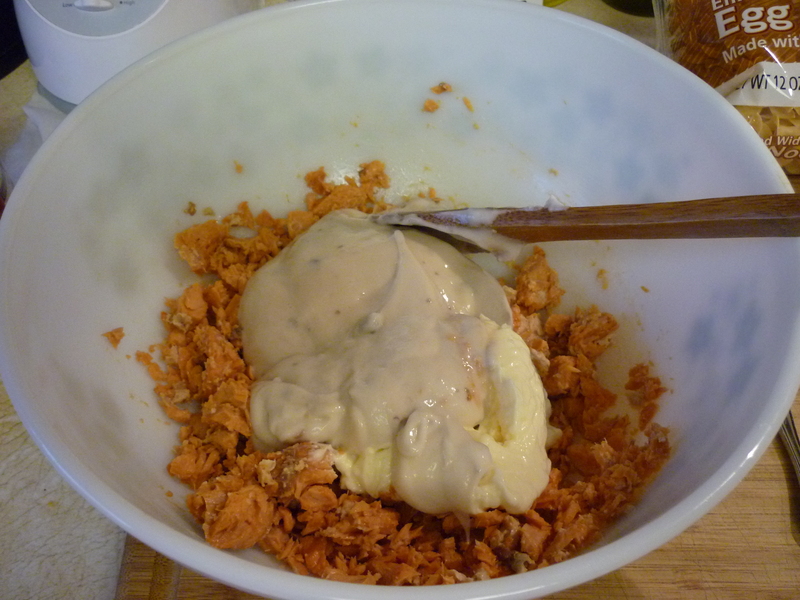 Add pieces of chicken to the dish and turn so that they are fully coated. I remove the skin and fat from the chicken as much as possible. You see here I could have added many more pieces of chicken if I were serving more people. No problem. 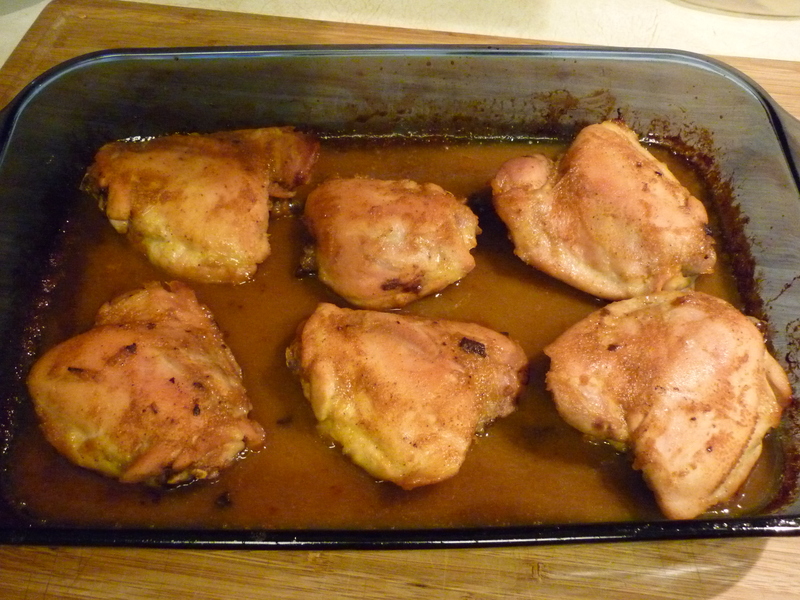 Bake at 375 degrees F, uncovered, for 50-60 minutes, turning chicken pieces occasionally. 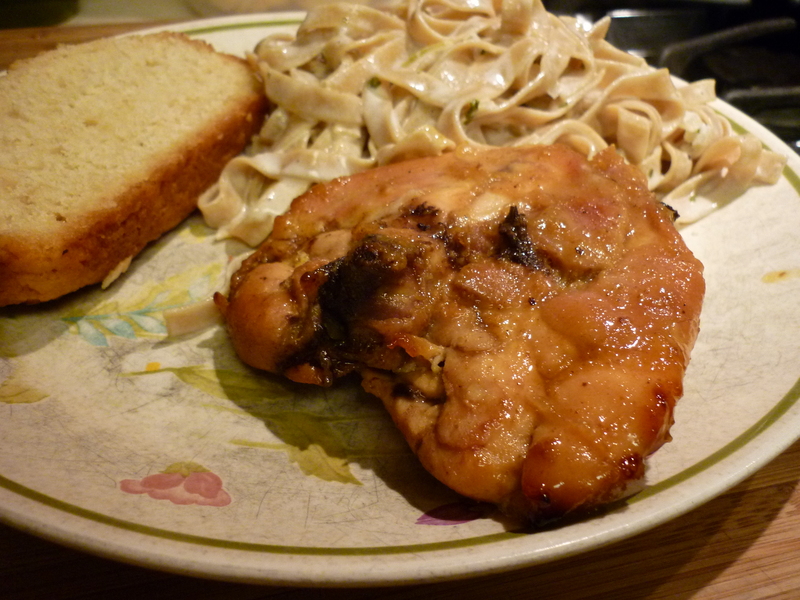 Make sure chicken is cooked through (when poked with a fork near the bone, juices should run clear).